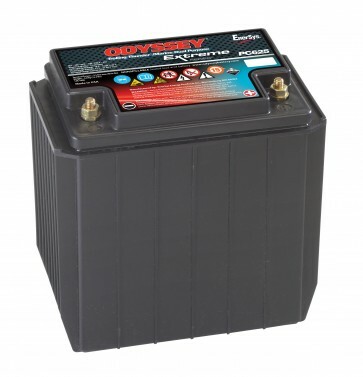 Thanks to rugged construction and AGM (Absorbed Glass Mat) design, the Enersys Odyssey PC625 battery has an 8-12 year design life and a 3-10 year service life. Welded intercell connections enable it to withstand extreme vibration, and AGM design holds acid in place to prevent spills, even when installed on its side. And unlike conventional batteries, Enersys Odyssey PC625 batteries can be stored for up to 2 years and still be returned to full power at 25 degree celcius storage temperature. Some batteries provide enormous cranking power. Others, deep cycle reserve power. The revolutionary Enersys Odyssey PC625 battery is designed to do both. How is this possible? The answer begins with flat plates made of 99.99 percent pure virgin lead - not lead alloy. Pure lead plates can be made thinner, so we can fit more of them in the battery. More Enersys Oyssey PC625 battery plates mean more plate surface area. And that means more power upto twice as much as conventional batteries.